As part of our coverage of the 2016 Presidential Campaign, we at ProMarket have used donations as a measure of revealed preferences. 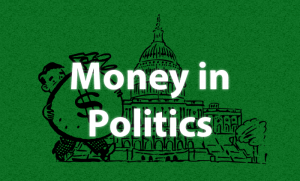 In this last report, we use political donors’ self-reported addresses from FEC data and the DataQuick database of residential real estate transactions to estimate the preference for candidates as a function of donors’ wealth. Hillary Clinton’s donors are wealthier than Donald Trump’s, at least judging from the value of their homes. The median home price of Clinton’s supporters is $639,796 while Trump’s donors’ median home price is $474,427. Libertarian Party nominee Gary Johnson’s supporters place second in the median residence price ($532,398), while Green candidate Jill Stein’s supporters are the least affluent among all donors. Table 1 reports the results for the Metropolitan Statistical Area of New York City, which shows similar patterns. Clinton’s donors are the wealthiest (median home price $1,126,670), while Trump’s supporters live in less expensive residences. On a relative basis, Donald Trump receives most of his support from donors living in less expensive homes. 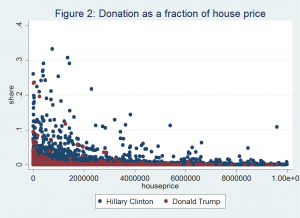 As Figure 1 shows, 27 percent of donors to Donald Trump live in residences worth less than $300,000, while for Clinton donors this number is 17 percent. 10 percent of Clinton’s donors live in residences worth more than $2M vs 5 percent for Trump. Not surprisingly, wealthier people tend to donate more, as Table 2 shows. In the case of Hillary Clinton, for donors contributing less than $5,000, the median home price is $623,080 and for donations above $100,000 it is $3.7 million. Donald Trump’s donations exhibit a similar pattern: the median home price for donors contributing less than $5,000 is $471,529 and for big donors it is $1,966,378. 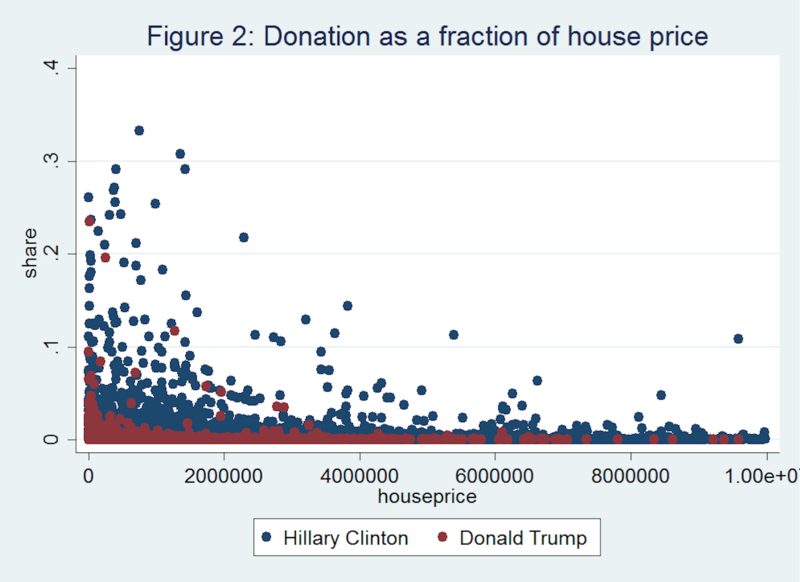 Finally, we analyzed donations as a fraction of home price. As Figure 2 shows, Clinton’s donors contributed in proportion to their wealth more than Trump’s supporters. This might reflect less enthusiasm for the Republican candidate: less affluent donors tend to donate more in proportion to their wealth than the wealthier population. In conclusion, these results explain why Trump’s average donations are smaller than Clinton’s: his donors, on average, are less wealthy, and they also choose to donate less. The results also highlight the concentration of Clinton’s donations that we have illustrated throughout the election with our Campaign Financing Capture Index and show that this concentration is not just the result of a few large donors: Hillary Clinton attracts more wealthy donors. Calculations used data from the Federal Elections Commission for the 2016 election and real estate prices from DataQuick. In particular, we used data on donations from itemized individual contributions, PACs, super PACs, and Joint Fundraising Committees. Data includes total contributions made by each donor in the 2016 presidential election. DataQuick provides information about residential real estate prices with transaction dates for each property, transaction prices, and detailed information about the type of transaction as well as whether the transaction was a distress sale. 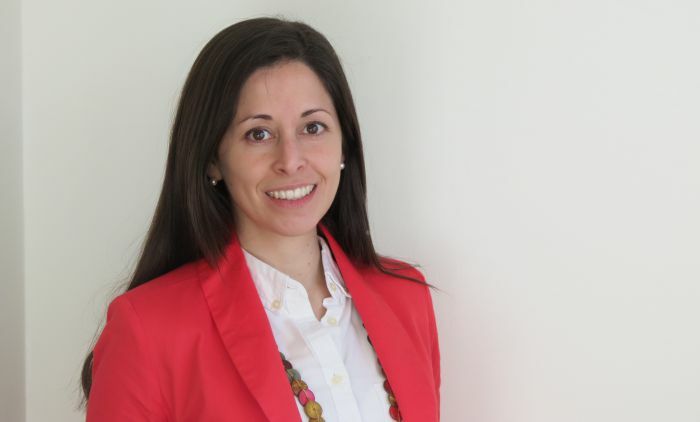 For this analysis, we only considered transactions that were not distress sales. The datasets were matched using the self-reported address of the donor. 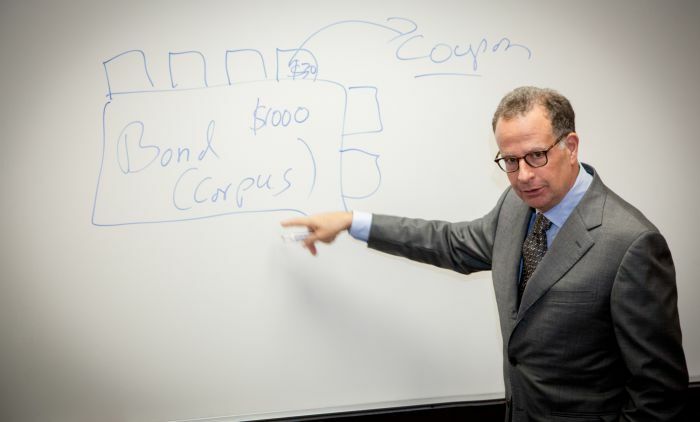 In particular, the match used street, zip code, number, and unit number of the property. Home values from transactions (observed at the time of the sale) were converted into current values using the S&P CoreLogic Case-Shiller U.S. National Home Price Index. We explored whether the sample we were able to match looked similar to the overall sample. Table A.1 shows that the distribution of donations to candidates in the matched sample is similar to the distribution of donations to candidates in the overall sample. This suggests that the sample is not biased towards any candidate.